We’d love your help. Let us know what’s wrong with this preview of The Deluge by Mark Morris. It came from nowhere. The only warning was the endless rumbling of a growing earthquake. Then the water came—crashing, rushing water, covering everything. Destroying everything. When it stopped, all that was left was the gentle lapping of waves against the few remaining buildings rising above the surface of the sea. Will the isolated survivors be able to rebuild their lives It came from nowhere. The only warning was the endless rumbling of a growing earthquake. Then the water came—crashing, rushing water, covering everything. Destroying everything. When it stopped, all that was left was the gentle lapping of waves against the few remaining buildings rising above the surface of the sea. To ask other readers questions about The Deluge, please sign up. I dropped a couple stars here because I am rather disappointed. First of all, I did enjoy the book. I would suggest it to my friends. I liked the story. I felt for the characters. I thought the action was paced well. I was asking questions all the way to the end. Therein lies the problem. Even at the end none of my questions was answered. Not One. I think it is good when a book leaves you with a certain level of questioning: societal issues, psychological demons, who am I, why are we here. That I dropped a couple stars here because I am rather disappointed. First of all, I did enjoy the book. I would suggest it to my friends. I liked the story. I felt for the characters. I thought the action was paced well. I was asking questions all the way to the end. Therein lies the problem. Even at the end none of my questions was answered. Not One. I think it is good when a book leaves you with a certain level of questioning: societal issues, psychological demons, who am I, why are we here. That sort of thing. But to introduce life forms (alien? we never find out) and a super-calamity (natural? alien-related? we never find out), characters on the verge of death as they attempt to escape (did he die? we will never know) with no hope of resolution in book 2? There is no sequel?? In real life we do not always find answers to life's persistent questions,this is true. But this truth does not necessarily make for good storytelling. I don't need a happy ending but some kind of ending would be good. A fun, fast read, The Deluge goes more for the gross out rather than true terror. The influences definitely show (The Stand. Invasion Of The Body Snatchers, The Walking Dead), but at least the characters are real enough that you want to continue turning the pages. 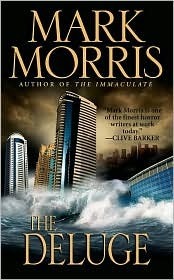 If Mark Morris writes a sequel, I'll certainly read it, but I'm not running to the store for another novel by him. I passed Deluge up on its original publication because the reviews in general rated the book as mediocre at best. Still, the synopsis was tempting enough that I kept wondering about the book: In the dead of night, London suddenly and impossibly floods. Water covers all but the tops of the tallest skyscrapers, wiping out the majority of the population. When the floodwaters recede the survivors find that they are not alone. Well, I finally bit the bullet and ordered the book. As soon as I started I passed Deluge up on its original publication because the reviews in general rated the book as mediocre at best. Well, I finally bit the bullet and ordered the book. As soon as I started reading, I was glad I did. The opening chapters of the book are its strongest moment. The description of the flood (which occurs at night, so is only described with sounds and sensations) is very effective and the characters have a little bit of depth to them The writing is several levels above the usual Leisure schlock. Once the waters drain (sooner than I was expecting), our heroes travel to Scotland to check on family members and the book becomes your typical post apocalyptic journey story (for a little while anyway). While there was always something happening here, I lost some interest. I guess it's because post apocalypse stories are invariably going to be similar to one another and nothing in this one necessarily stood out. This section is in no way bad. Just sort of so-so. Things pick back up once they discover their first 'other', my interest piqued again. I enjoyed the rest of the book, but even at its best it never quite gets back up to the levels established at the beginning. The bulk of the book is an above average horror/sci-fi story that mixes elements of The Day After and The Thing. Unfortunately, as good as it is, that tale is preceded by a much stronger introduction that made me feel that even though I was enjoying the book, the author could do better. Ok I will admit that this was a totally new book and author to me and I took one of my random gambles on it. I must say that it was a mixed book to me - and it seems I am not the only one. Anyway the book- well again I will not give the story away but it feels like it come is sections. Now I am no author and I am sure I will be told that is how books work - but this one felt like several separate stories with the characters coincidentally having the same names. Each story had similar aspects but Ok I will admit that this was a totally new book and author to me and I took one of my random gambles on it. I must say that it was a mixed book to me - and it seems I am not the only one. Anyway the book- well again I will not give the story away but it feels like it come is sections. Now I am no author and I am sure I will be told that is how books work - but this one felt like several separate stories with the characters coincidentally having the same names. Each story had similar aspects but at the same time totally different plots and at times styles too. What is more I read that this is a stand alone book and with no sequels - which means all those questions the book raises will not be answered - which is a shame as its set itself up quite nicely. That said this book approaches the theme from a different angle and for that made it incredibly enjoyable which for me mitigated a lot of its shortfalls. First review from my EVO, so we will see how it works out! There were a lot of things that happened in this book that were to "easy" or "neat" for the storyline. There are good parts that made me feel a little naseaus when descriptions of the dead (espically the kids....still makes me cringe). Good story though that mixes in some science fiction with horror...left me with a lot of unanswered questions, but isn't that what a good book will do many times!?!?!?!? Mark Morris is a great reader style-wise, but while the plot is a good one—a flood covers the entire world, leaving few survivors—and the characters are well written, the story just didn't keep my interest. It seemed like just another survivors-band-together-after-a-cataclysm story with nothing new to add to the genre. But maybe I've read too many of them over the years? The second post-apocalyptic novel I've finished today, and also the second book I've read today that I got as part of a three-for-a-pound deal at my local charity bookshop. Coincidence? Well, yes, obviously. This book isn't dreadful, it just doesn't feel very original. It's a loosely cobbled together mish mash of scenes from 28 Days Later, The Thing, Invasion of the Body Snatchers, and a few others. The story isn't badly told either, although it does seem like the author rushed through the beginn The second post-apocalyptic novel I've finished today, and also the second book I've read today that I got as part of a three-for-a-pound deal at my local charity bookshop. Coincidence? Well, yes, obviously. This book isn't dreadful, it just doesn't feel very original. It's a loosely cobbled together mish mash of scenes from 28 Days Later, The Thing, Invasion of the Body Snatchers, and a few others. The story isn't badly told either, although it does seem like the author rushed through the beginning and then stopped before the end. One aspect of the plot that seems slightly clumsily handled is the number of characters. Initially the group we follow has nine members; they're picked off one by one because this is a horror book. But then towards the end of the book a fresh bunch of people are brought into the story, although most of them are nothing more than names whose only contribution to the story is to be killed at the end, seemingly to make the ending appear exciting and dangerous while in fact letting a bunch of people die while keeping most of the original characters alive to see the end of the story. The basic problem with any post-apocalyptic novel is that it doesn't end. It just kind of picks a place to stop, and that's when we're done with our little group of survivors. The best scenes are the beginning, when the disaster, whether its, plague, zombies, or plague zombies, wipe out civilization, and then the rest of the book is a collection you've seen before: scavenging, the hope spot, the encounter with cannibal rapists, the last stand and so on. This one is no exception. Where it does sco The basic problem with any post-apocalyptic novel is that it doesn't end. It just kind of picks a place to stop, and that's when we're done with our little group of survivors. The best scenes are the beginning, when the disaster, whether its, plague, zombies, or plague zombies, wipe out civilization, and then the rest of the book is a collection you've seen before: scavenging, the hope spot, the encounter with cannibal rapists, the last stand and so on. This one is no exception. Where it does score points, and a lot of them, is the inventiveness of its apocalypse. The flood is an original concept, despite being a persistent problem in parts of the world and, y'know, being in the Bible and all. And instead of zombies, we get... well, it's tough to say, as the descriptions are intentionally vague. They come off like Lovecraftian blobs of protoplasm with The Thing-like ability to absorb people and then look like them. So that's at the very least interesting. The survivors have a few bright spots in terms of characterization as well. From time to time the casts swells beyond the author's ability to handle it, but he quickly gets around to winnowing them down. The blurb: "It came from nowhere. The only warning was the endless rumbling of a growing earthquake. Then the water came - crashing, rushing water, covering everything. Destroying everything. When it stopped, all that was left was the gentle lapping of waves against the few remaining buildings rising above the surface of the sea. "Will the isolated survivors be able to rebuild their lives, their civilisation, when nearly all they knew has been wiped out? It seems hopeless. But what lurks beneath The blurb: "It came from nowhere. The only warning was the endless rumbling of a growing earthquake. Then the water came - crashing, rushing water, covering everything. Destroying everything. When it stopped, all that was left was the gentle lapping of waves against the few remaining buildings rising above the surface of the sea. "Will the isolated survivors be able to rebuild their lives, their civilisation, when nearly all they knew has been wiped out? It seems hopeless. But what lurks beneath the swirling water, waiting to emerge, is far worse. When the floodwaters finally recede, the true horror will be revealed." I read an article by Mark Morris in the British Fantasy Society Jornal (Spring Issue) in which he mentioned "The Deluge" and I was intrigued, particularly as I love apocalyptic fiction. It was a fast-paced. I don't know how to summon up my feelings on this book, at some points it was really exciting that it made me want to keep on reading it, and wanting it to be into a series. And other points I just read cause I was curious what was going to happen on the end. Anyways, what happens on the end is what happens on every typical horror(or end of the world) books. Almost everyone ends up dying and they just fly into the sun to another future. But if you want a short simple apocalypse book to read, i suggest this it's not as confusing as some. Cool hybrid apocalyptic/horror/sci fi read, evoking a couple images from The Road -- there's one scene that I recall where the group specifically mentions a grown man and a boy walking together in the wasteland. It has elements of apocalyptic reads and zombie books I like: last person on earth moments, marauding/roving gangs, interesting group dynamics, plenty of scares, gruesome discoveries, etc. Thanks be to Paperback Swap for this one! I give The Deluge 3.5 stars. Mark Morris manages to make this struggle for survival interesting. The characters are decent people who are determined to stay that way at their core. They refuse to revert to a survival of the fittest mentality which makes for some for interesting dilemias. All in all a good read with some twists to it. This book wasn't the apocalyptic book that I thought it was, but it was indeed a good story. The groups struggles to survive after a worldwide flood take them through emotions and moral conflicts that would leave many in despair. I did find the ending a little disappointing, it left me hanging out in the middle of nowhere, with no hope of finding what or where 'the end' really was. I liked the beginning of this one -- probably up until about halfway through, then I started to really *not* like it. The reasons behind the "deluge" seemed like the author had no other ideas, and he came up with something pulled from a hat. If the book had been longer, or maybe an immediate sequel, I'd give it a higher rating; as it is, it stands at a meager two stars. That was one amazing ending! This book was all around amazing. It was so unique. The aliens, the way the world changed, the writing was amazing, easy to follow and understand, kept my focus, and gosh I just loved it! It did leave a few unanswered questions which aggravated me but overall a 4.8 stars! This review has been hidden because it contains spoilers. To view it, click here. Started off so good as many books do but ended so badly that I can't bear it. Read it page after page, enwrapped and engaged and then.. This was a fun one, if very like "The Stand" and "Swan Song" in too many ways. Well-written overall; really gave me a sense of the weariness, uncertainty and clinging filth experienced by the characters. An enjoyable romp through post apocalyptic Britain. The reason for the three is there is no explanation for the flood nor any closure on where the blue lightening/eggs/creatures originate from. Also it ends abruptly with the end of the major fight in Scotland. I think this was a really good story. I think if not for the ending I would have given it at least 4 stars. It just feels like there should be more to it, more answers. But I still think it was worth a read, well written and with lots of action and suspense. Great story. Eerie and with a great post-apocolyptic feel. The book is a bit weak in the beginning, though. I thought that this was a really good book up to the end. Then it just kind of stopped. No explanations or alluding to a sequel. It kind of left you just wondering. Great read. Twists and turns, and quite a spooky feel.